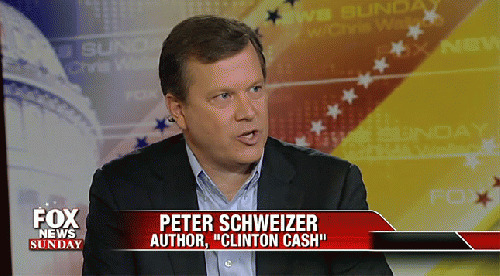 Ever since Peter Schweizer's new attack book Clinton Cash was touted as the must-read tome of the campaign season, a growing number of media organizations, including Politico, BuzzFeed, ABC News, FactCheck.org, and Time, have detailed factual shortcomings in the book. (Media Matters has, too.) Noticeably absent from that fact-checking procession has been The New York Times and the Washington Post, the two newspapers that entered into exclusive editorial agreements with Clinton Cash's publisher. The Times' and Post's seeming lack of interest in detailing the book's long list of mis-statements certainly raises questions about whether the papers' exclusive pacts made the dailies reluctant to highlight Clinton Cash's obvious shortcomings. After all, if those other media organizations can find the Clinton Cash errors, why can't the Times and the Post? And even if Times and Post reporters can't spot the misinformation, why aren't they at least writing about the key revelations that others are uncovering? Recall that it was the Times that trumpeted Clinton Cash as the "the most anticipated and feared book" of the campaign season. If it's so important, why isn't the Times documenting the crucial errors found between the Clinton Cash covers? By entering into exclusive agreements, both the Times and the Post used Clinton Cash as the basis for larger investigative articles that raised questions about the Clintons' finances. Hyped by its publisher -- the Rupert Murdoch-owned HarperCollins -- as being "meticulously researched and scrupulously sourced," Clinton Cash has instead turned out to be a mishmash of allegations glued together by innuendo and falsehoods. That, according to an array of news outlets that have documented the book's shortcomings. "An independent review of source material by ABC News uncovered errors in the book, including an instance where paid and unpaid speaking appearances were conflated. Schweizer said the errors would be corrected." "Bill Clinton was not paid for several speeches as reported in a forthcoming book about his family's foundation, spokespeople for the former president said Tuesday." "While Clinton's stance toward India evolved over the years, a review of then-Sen. Clinton's statements and votes while the Indian nuclear deal was under debate shows that one of the key facts in Schweizer's argument on the topic is false -- Clinton actually publicly stated her support for the deal in 2006. Another is in dispute." "The author of 'Clinton Cash' falsely claimed Hillary Clinton as Secretary of State had 'veto power' and 'could have stopped' Russia from buying a company with extensive uranium mining operations in the U.S. In fact, only the president has such power."